Each year, over a hundred Education First volunteers come together to fulfill one mission – to raise money and provide college scholarships to underprivileged high school students, so they can have a better chance at attaining a college education. Since our founding in 1995, Education First has awarded over $750,000 in scholarships to exceptional graduating high school seniors across the country. Our scholars come from different socioeconomic backgrounds and have each overcame unique obstacles. However, they all share similar traits of resilience, determination, and desire for a higher education. Sayra Escobedo, Education First 2007 scholar, embodies all of these traits. Sayra immigrated to the United States from Mexico at just three years of age. Throughout her childhood, Sayra excelled inside and outside of the classroom. While attending the Thomas Jefferson High School in Los Angeles, Sayra was flourishing in her studies. She also part of the Key Club, a community service organization where hard-working and conscientious students perform an array of community service projects. Due to her strong performance and passion to help others, Sayra was soon nominated to become the President of the Key Club. As Sayra approached the senior year of her high school, she understood that a college degree was the surest path to economic success in America. Even though no one in Sayra’s family had attended college before, Sayra had long dreamed of attending UCLA, one of the most selective and prestigious universities in the world! However, due to the lack of access to financial support and financial aid, Sayra’s ambitions to attend her dream university was in jeopardy. During her senior year of high school, Education First volunteers learned of Sayra’s story and felt touched by her drive and determination. Sayraembodies the exact type of students our organization is set out to support. Our volunteers saw the potential in Sayra, and awarded her the Education First scholarship in 2007. With our financial support, Sayra was able to attend UCLA and become the first person in her family to go to college! Sayra graduated from UCLA in 2011 with a Bachelor’s Degree in Psychology. She is now working towards her Master’s Degree in Psychology at CSU Northridge. 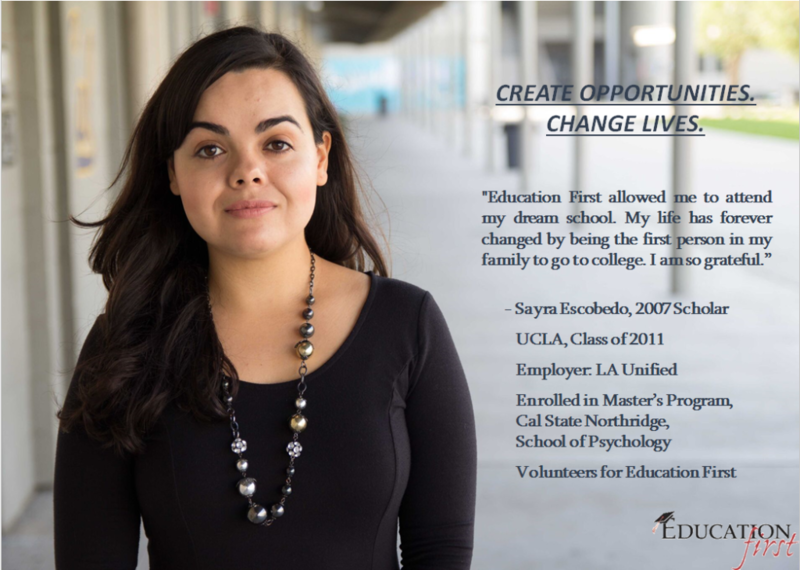 This year, 11 years after receiving her Education First scholarship, Sayra Escobedo has joined Education First as a volunteer in the Los Angeles chapter. Along with other volunteers, Education First will look to provide financial support and mentorship to other deserving high school students who depend on your help to achieve their dreams of attaining a higher education.